Santorini, is probably the most famous island of Greece. It is also one of the most romantic places on earth. A volcano island, which boasts amazing views over the Aegean sea and a main village, the “Fira”, where you will find yourself in perfectly painted white houses and stone-paved streets. At Santorini you will enjoy its strange volcanic beaches, the Red Beach and the Black beach of Perivolos, while daily cruises will get you to the volcano, 1 mile away from the island. We have been in Santorini several times. We love this strange island. We have found the best places to stay, to eat, the best cruise to make, the best beaches to go and all of these in just 3 days. This is not an ordinary travel guide. This is actually a travel itinerary. It will give you only one and perfect option on where to stay and what to do every hour of the day. 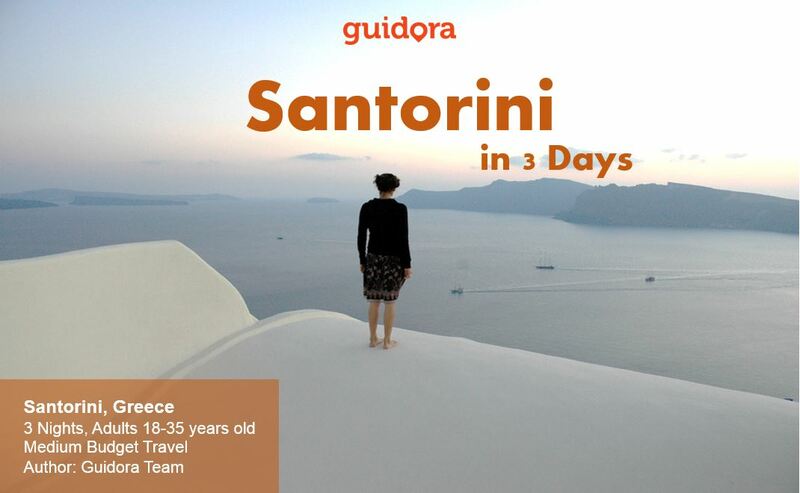 We will also tell you the “How”, not only the “What” to do in Santorini, so that you save time and money. We will tell you how to get to Santorini from Athens, what dishes you should try in the restaurants, what are the costs for every activity (renting a bike or a buggy, or a car) and so many other insider travel hacks and tips. It features visits to Oia, to Fira, to Perivolos and other places that tourists and sometimes only locals know. You will not find this information on the internet and we have designed the Santorini Travel Guide and Itinerary for 3 days in such a way that it will give you the feeling that you have your best friend on the island, showing you around. Get this amazing Travel Guide and Itinerary below!